Contents stay clean and dry in our high-intensity door knob bags. Weather elements have no effect on company brochures, magazines, and newspapers. The leak proof bags have cardboard headers with hang holes. They are quick and easy to load and mount on door knobs. Catalogs, flyers, and samples slip into the custom printed leak proof bags. All orders from our company have custom printing available. The custom leak proof bags, made from stiff polyethylene, are durable and tear-resistant. Imprinted leak proof bags are a combination of economics and strength. The door knob bags are an economical way to kick-off a promotion. Slip the information into the bags and place them over door knobs. The promotion, presented at hands reach, is a clever way to distribute giveaways, flyers, newsletters and other handouts. Because they are off the ground and packaged to keep contents clean, they are likely to be read. 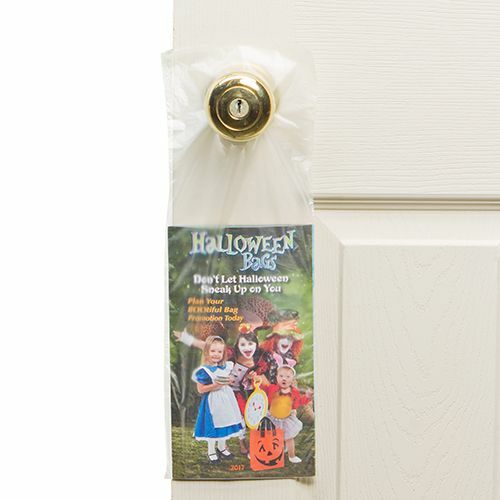 When leaving material at someone’s door, using door knob bags protects the brochures, estimates, and invoices. We offer free samples to those who complete the online form we provide. We guarantee on-time production. When the need arises, we gladly offer rush production. If you want an image or custom logo printed on the door knob bags, call or order online today. Your source for Door Knob Bags and Poly Bags.